Heartbroken Madonna posted a touching snap of her teenage son as she battles to get him to come home. 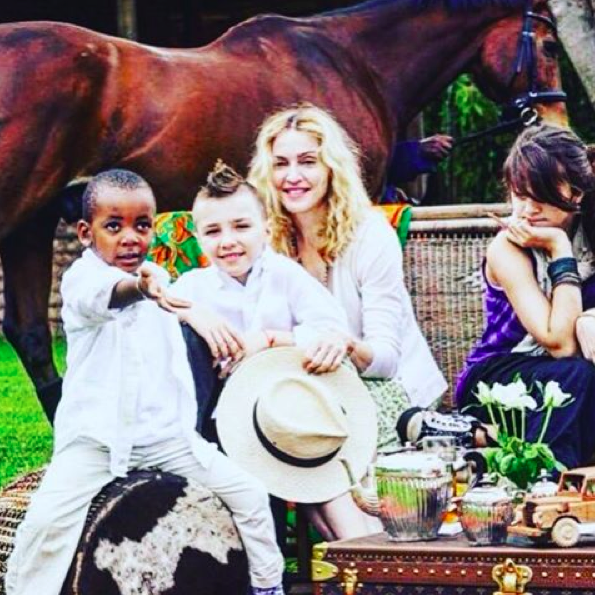 The 57-year-old took to Instagram and shared a sweet throwback photo of son Rocco in Malawi, along with adopted child David Banda, 10, and eldest daughter Lourdes, now 19. She captioned the photo: “Days of innocence. In Malawi. How I miss this time. #rebelhearts” She added a sad emoji face along with an arrow-punctured heart, prayer hands and a red heart. Madonna is currently fighting to get Rocco to return to her after the 15-year-old opted to stay with his father, Guy Ritchie, in London. As court proceedings rage on, it is clear the Queen of Pop is missing her oldest son. According to TMZ Madonna has reportedly hired a private investigator to keep tabs on her son Rocco while he lives in London with his father Guy Ritchie. Sources connected with the singer told the site that ‘Madonna believes Guy has set no rules for 15-year-old Rocco and he’s living dangerously’.